There are few things in this life as physically and emotionally devastating to a family or business as a fire. Knowing what to do after a fire can help reduce the damage and increase the chances of a successful restoration. Even if the entire structure wasn’t destroyed the water that was used to extinguish the flames might damage things that were not burned up. There might be holes in the walls from the firefighters looking for hidden flames and they may have even cut holes in the roof to let out smoke and heat. Restoration can be difficult, dangerous and in most cases require professional expertise and equipment. There are risks to your health and safety that specialists are trained to deal with and can be life threatening if not handled properly. The most important thing is patience. Estimates, remediation and restoration take time. Working with a company that is specially trained to deal with disasters can make the experience easier. Not all companies are created alike and while “your neighbor’s friend’s cousin” might be a great guy and an amazing handyman he most likely is not trained or certified in the proper techniques for removing soot and water from a fire scene. Water damage can lead to more damage or even mold if not dried properly. It is important to understand that even though the fire is out, there are still health and safety risks. Dirty water and soot may contain contaminants and chemicals that can make you sick. Trying to clean up the damage yourself may make things worse and cost you more in the long run. 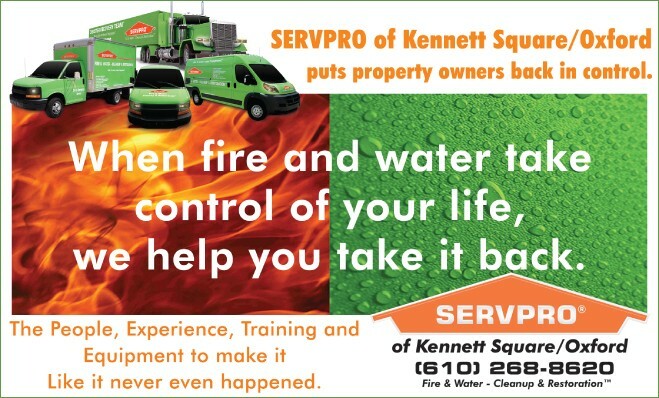 SERVPRO of Kennett Square/Oxford is a family owned franchise that specializes in cleanup and restoration from fire and water damage making it “Like it never even happened.” Our track record of results has earned us the trust of the insurance industry, countless homeowners, the Red Cross, and in one unforgettable instance, even the Pentagon. Never enter a damaged building unless the fire department says that it is safe to go in. Understand that if the building has been severely damaged you might not be permitted to enter at all. Call your insurance company or agent as soon as possible. They can make recommendations about who to call to address the immediate needs of your home such as pumping out water or boarding up doors and windows. Contact your local disaster relief service, such as the Red Cross. They will help you find a place to stay, food, medicine and other important things. Call family members to assure them that you are ok and, if needed, where you will be staying while your residence is uninhabitable. If your home is uninhabitable, contact the local police department to let them know that the site will be vacant. The fire department will confirm that the utilities are safe to use and if not, will shut them off before they leave. Do not try to turn them back on yourself. Don’t try to remove soot from walls or painted surfaces. Don’t shampoo carpets or upholstered furniture or dry clean garments. Improper cleaning may set in the smoke odor forcing you to discard the items. Discard all food and beverages that may have been close to the fire, heat or water. If they are contaminated, consuming them will make you sick. Never assume that a clean up company was sent by the insurance company and don’t sign anything without speaking with your insurance agent. Our staff is highly trained in property damage restoration. From initial and ongoing training at SERVPRO’s corporate training facility to regular IICRC-industry certification, rest assured our staff is equipped with the knowledge to restore your property. With a nationwide system of qualified franchises, no damage is too large or too small for SERVPRO of Kennett Square/Oxford. For more information call us at 610-268-8620 or visit our website: www.servprokennettsquareoxford.com. ← Previous Story Why DO I Need Gutter Protection? Next Story → Should I Or Shouldn’t I Hire An Interior Designer?